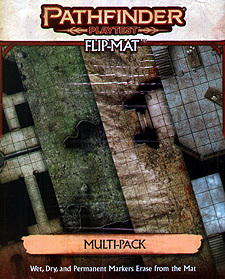 Playtest the new Pathfinder rules in style with this collection of two double-sided Flip-Mats featuring four key encounter areas from the Pathfinder Playtest Adventure: Doomsday Dawn! Featured areas include a burnt-out crypt under the city of Magnimar, a ruined temple in the demon-infested Worldwound, a wizard's tower beside a remote mountain pool, and an arcanist astronomer's subterranean workshop! These portable, affordable maps measure 24" x 30" unfolded and 8" x 10" folded. Their erasable coated surface can handle any dry erase, wet erase, or even permanent marker.